Introduction to Brian Rothschild & The John Lennon Educational Tour Bus. Video: Jade Cheek. Photo & Design: Raymond Elman. 3:17 min. 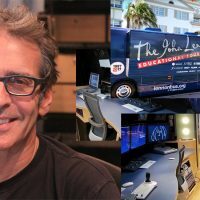 In 1998, along with Yoko Ono Lennon, Rothschild created the first version of the John Lennon Educational Tour Bus and has since devoted his time to expanding the project around the world with support from corporate sponsors including Apple, Canon, Montblanc, Yamaha, Adobe, Juniper Networks, and many more. Today, Lennon Bus Europe and Lennon Bus U.S. provide young people with free hands-on opportunities to create original digital media projects including music, videos, short films, documentaries, games, apps and livestream productions reflective of their ideas and concerns. Tell us about the arc of your career starting with college and including connecting with Yoko Ono. VALUES LEARNING PROCESS: 3:38 min. Hampshire College is such an unusual place, can you describe what it was like and what enabled you to thrive there? What did you learn at Hampshire that still informs you today? OVERCOMES CHALLENGES TO SUCCEED: 4:59 min. Describe the evolution of the John Lennon Educational Tour Bus. Talk about your collaboration with The Betsy Hotel on Ocean Drive in Miami Beach. How do you decide where to go, which communities you want to reach out to, who you will collaborate with? It sounds like the organizations with which you collaborate need to do a year’s worth of planning before The Lennon Bus arrives. UNDERSTANDS THE BUSINESS OF ART: 1:14 min. Describe the various configurations of The Lennon Bus and some of the things that can be done on board.